Mother of murdered soldier whose body has been held by Hamas since 2014 demands UN coordinator insist Hamas release her son's body. Wednesday, August 1, marks four years since IDF soldier Hadar Goldin was killed and his body kidnapped in a Rafah battle. 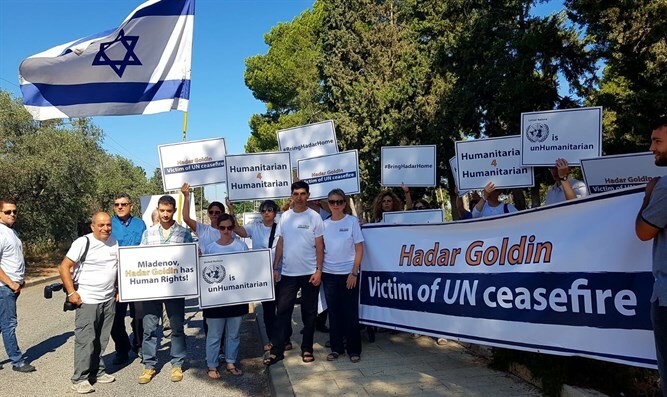 To mark the day, the Goldin family and "Misdar Hadar" volunteers will hold a demonstration outside the United Nations (UN) headquarters in Jerusalem. Goldin's body was dragged into a tunnel during a "ceasefire" initiated by former United Nations Secretary General Ban Ki-moon. On the one hand. the UN did not take responsibility for the kidnapping, and did not demand Hamas return Hadar's body. On the other hand, the UN has continued supporting Hamas and Gaza. The protest began at 9:00a.m. with a moment of silence. Afterwards, Dr Leah Goldin, Hadar's mother, will address the UN representative to the region, Nickolay Mladenov. The Goldin family will demand the UN act according to international law, take responsibility for Hadar's kidnapping, and return the missing Israelis to Israel, in accordance with their humanitarian rights. Today marks the 4th anniversary of the abduction and murder of my son Hadar Goldin, and of the murder of Liel Gidoni and Bnaya Sarel, during a ‘humanitarian ceasefire’ on August 1st 2014, mandated by the United Nations and USA, and supported by the EU. This heinous act, committed by Hamas, stands in clear violation of the UN sanctioned humanitarian ceasefire, undermining International Humanitarian Law specifically and human rights in general. Furthermore, with every day that goes by, the PA is implicated by aiding and abetting this standing violation of International Humanitarian Law by Hamas. My son was not a victim of the war in Gaza, but rather a victim of the ‘humanitarian ceasefire’ brokered and sponsored by the United Nations. We, his remaining loved ones, demanding the right to perform the basic final act of human dignity, the right to proper burial, are not victims of the war in Gaza, but rather victims of the same humanitarian ceasefire - brokered and sponsored by the United Nations. Following Hamas’ violation of the ceasefire, the UN Secretary-General, Ban Ki-moon issued an official statement, condemning in the strongest terms the violation by Hamas of a mutually agreed humanitarian ceasefire. He expressed shock and profound disappointment by these developments. He stressed that the acts of Hamas constitute a grave violation of the ceasefire. He added that such moves call into question the credibility of Hamas' assurances to the United Nations and he demanded the immediate and unconditional release of the captured soldier. However, apart from this clear and explicit condemnation of Hamas by the leader of the United Nations absolutely nothing has happened. There has been only a four year long, painful and brutal silence. On December 22, 2017, the United Nations Security Council (UNSC) held a special session on International Humanitarian Law and the repatriation of the remains of Hadar Goldin and Oron Shaul – the two Israeli soldiers abducted and murdered by Hamas during the 2014 Gaza war. This historic hearing of the UN Security Council was co-hosted by the United States and Ukraine, at which Former Minister of Justice and Attorney General of Canada, Professor Irwin Cotler, described the clear violation of international humanitarian law and its’ implications. In response, UN Member States unanimously expressed their solidarity and demanded the return of the remains of Hadar and Oron. They highlighted that the refusal to repatriate the remains of murdered soldiers constitutes an egregious violation of the most fundamental principles of human rights and human dignity that underpin humanitarian law. Participants reaffirmed that the Secretary-General and international organizations must work to secure the return of the remains, lest the international community itself indulge a culture of impunity in defiance of UN norms. Mr. Mladenov, we have met several times, both in Israel and at the UN GA, at Hadar’s art exhibition called ‘Hadar-The Final Peace’ in 2016. Nonetheless, and although you are deeply concerned with the humanitarian crisis in Gaza, I have never heard you call for the return of Hadar to Israel for decent burial according to basic human decency, the Jewish tradition, Islamic Law and International Humanitarian Law. It is this connection that must be made if the humanitarian situation in Gaza is to improve. A regime that disregards the rule of law so blatantly must be held to account. Any parties that do not stand up to it are de facto aiding and abetting. The continued, defiant violation of the foundational principles evidences an abiding disregard, disrespect and denunciation of UN and EU values, institutions, and norms. This cannot be accepted. The "rules based international order" is about compliance with International Humanitarian Law obligations; it is about combating cultures of impunity. As trustees of human rights and International Humanitarian Law, all UN institutions and representatives have a responsibility to see that those legal obligations are respected and implemented. As the representative of these institutions, values and norms in the region, committed to advancing human rights in Gaza, it is your role that requires making demands of Hamas and representations to the Palestinian Authority, to remedy the violations of International Human Rights and Humanitarian Law, and to put an end to this culture of impunity. In order to protect and uphold the law and UN institutions; in order to truly advance the cause of human rights in Gaza and in the region – it is imperative to bring Hadar home from Gaza immediately and unconditionally.